Global subscription video-on-demand (SVOD) users will climb from 478 million today to 743 million by 2023, according to Rethink Technology Research. 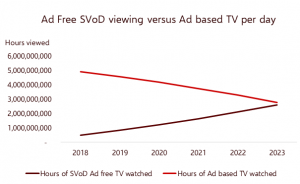 The analyst firm said that the US market will rise from a SVOD and vMVPD base of some 146.5 million today to 236.6 million subscriptions by the end of 2023. 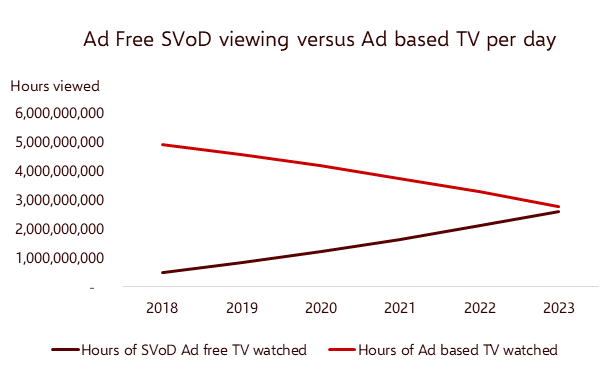 Europe and Asia are expected to be neck-and-neck in terms of SVOD revenues by 2023, but with far fewer subscribers in Europe paying significantly more than those in Asia – a region dominated by large ad-supported VOD streaming numbers. “Netflix will continue to lead in SVOD in both subscribers numbers (outside of China), but will make up 194 million SVOD customers out of 743 million globally by 2023, some 26% of total global subscribers,” according to the report. Rethink Technology Research is a UK-based research and analyst firm that focuses on the IoT, video, and wireless markets. For more information and to access the full report, click here.